This book won the William Hill Sports Book of Year in 2009 and is one of the worthiest winners of the award. The Bodyline cricket series is remembered as the only aberration to the greatness and near immortality of Donald Bradman ostensibly brought about by unfair means of bodyline bowling. The culpable men – Douglas Jardine and Harold Larwood. Unfortunately for Harold Larwood, Bodyline is all most cricket fans associate him with and remember him for. Well not anymore. All thanks to his fellow Nottingham man, Duncan Hamilton. In this meticulously researched and beautifully crafted book, Hamilton gives us a biography that a cricketer of Larwood’s stature truly deserves. Not only does he detail the pacer’s life before and after the cricket series, he also builds a convincing portrayal of what Bodyline truly was – a gladiatorial contest between a great batsman and a great fast bowler where the honours went to the latter. In doing so he debunks the commonly held belief that Jardine, Larwood and company used unfair means to stop the Don. The hero-villain depiction was also created because of what happened after the series – Bradman went on to become the greatest batman in the game while the English cricket mandarins did a quick about turn and banished Jardine and Larwood from the game, finding them guilty of tarnishing the game. The passing years cemented this belief and the genuinely great quick bowling exploits of Larwood were lost and forgotten. Luckily, Larwood’s feats were recognized and applauded by most of the Aussies who played in the historic series. And that remains the greatest proof that Larwood was one of the greatest who delivered a performance for the ages. The book traces Larwood’s journey from being a young Nottinghamshire miner to becoming the fastest and most feared bowler in the world, whose career and honour are ruined by injury, politics and an ungrateful cricket establishment, before he finds redemption and peace in Australia and amongst Aussies. The book is full of wonderful anecdotes which make for fascinating reading. Duncan Hamilton is at times a little too sympathetic to Harold, but we can allow him a little leeway given that he is restoring the glory of a cricketer who got more than his fair share of bad luck. He played a cerebral role in finding a chink in Bradman’s armour and creating a weapon to exploit it. This helps correct his historic portrayal as a dim lad who was Jardine’s lackey. The two shared a great relationship till the very end. Larwood had the highest regard for his captain and never blamed him for his miseries. The two have never been given their due for being so far ahead of their time and doing something which has become an industry in itself today – detailed video analysis to study opponents and prepare for games. 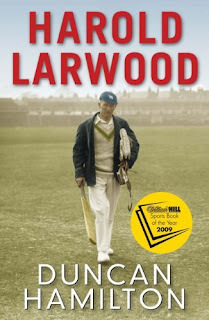 One of the strengths of this book is Larwood’s detailed character sketch which paints Larwood as a proud and honourable man who always gave his best for king, captain and country in the most difficult circumstances. He was a principled man who refused to take the chance to resurrect his cricket career at the cost of his honour. The study of Larwood’s post bodyline trauma is touching. He is completely overcome with a deep sense of extreme injustice and unable to come to terms with it. He shuns the world of cricket and is afraid of facing his past colleagues. His redemption is equally heart warming. He finds a new life in Australia and slowly reconnects with cricket and cricketers. The respect and admiration that he receives from his fellow cricketers does most of the healing. Larwood was the worthiest adversary Bradman had and he was arguably the greatest fast bowler of his generation. In purely cricketing terms, he got the better of Bradman. He stuck to his principals in spite of his hardships and will never get the recognition he deserved. Bradman got fame and used it to make money. Duncan Hamilton has done his bit to make the long departed Larwood feel less aggrieved about life. He has done so by writing for Harold Larwood one of the greatest cricketing biographies if not the greatest cricket book of all time. Rating – This is a great book which deserves nothing less than five out of five. Where you can buy – The hardcopy can be ordered from Infibeam.com. It is fairly inexpensive.